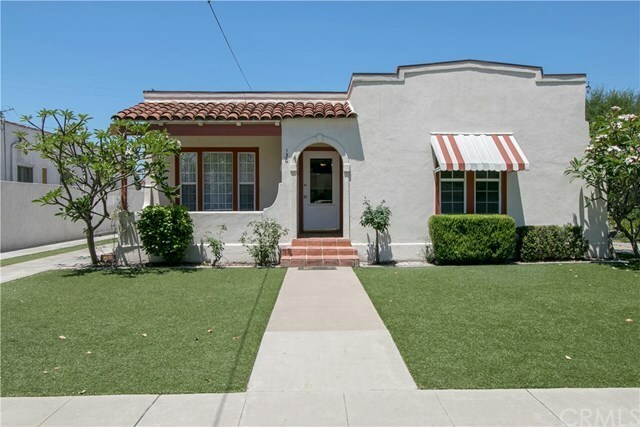 Live the Old Town lifestyle in this single level 1925 Spanish Revival vintage house with a three car garage and a separate guest apartment. This rare property is ideal for multi-generational households. The main part of the house is 1,760 sf of single level living space including a large family room with an exposed beam wood ceiling, a spacious kitchen, and three bedrooms including a master with an ensuite bathroom. Above the three-car garage, there is a separate apartment-style guest suite offering 926 sf of space including a large master bedroom and bathroom, a living room, and a space for a kitchenette. Downstairs, natural light streams through numerous windows, highlighting the original hardwood flooring while coved ceilings in the living and dining rooms add character and a sense of volume. A striking fireplace heater surround features original Batchelder tilework showing scenes of life in early California. The long, gated driveway could be used for RV or boat storage. Old Town Tustin is one of the most walkable neighborhoods in OC with numerous family-owned bars and restaurants plus summer concerts in the park and community events all within walking distance. The home is located in the award-winning Foothill High School boundary. No HOA. No Mello-Roos. Directions: Mountain View between First and Irvine.